Video games and Breaking Bad being two of the Internet’s favorite things (after Pokémon, of course), Vince Gilligan’s Shakespearean meth drama has been the subject of video game tributes before. 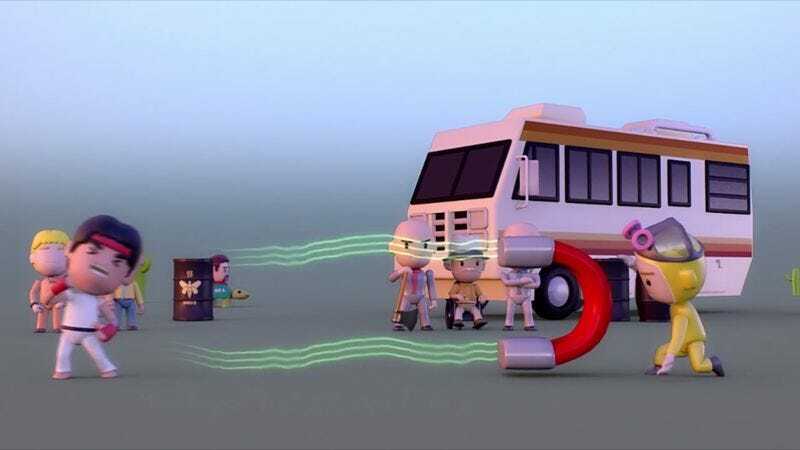 But this mashup of Breaking Bad and Street Fighter matching Ryu against everyone’s favorite meth cook Jesse Pinkman is just so darned cute, why not talk about yet another parody? Re-imagining both characters as vaguely Lego-ish cartoon figures, Ryu Vs. Jesse pits hero vs. anti-hero as Breaking Bad characters—including Gus Fring, Todd, and Tortuga—watch. Jesse’s combos include “Magnets” and “I Am The One Who Knocks,” and the fight bell is provided by Tio Salamanca. The short was created by a team led by animator Junior Jesman; Jesman works for Freestyle Games, the UK-based games studio best known for creating DJ Hero. In case you’re wondering, yes, Breaking Bad’s final season did already air in the UK. They just had to watch it on Netflix.